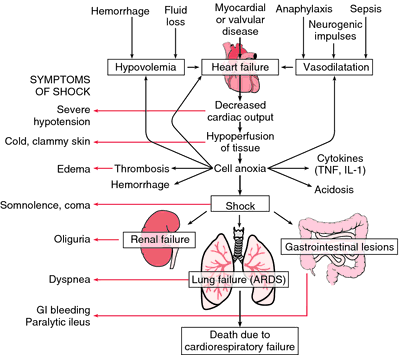 shock caused by a reduction in volume of blood, as from hemorrhage or dehydration. a state of physical collapse and prostration caused by massive blood loss, about one fifth or more of total blood volume. The common signs include low blood pressure, thready pulse, clammy skin, tachycardia, rapid breathing, and reduced urinary output. The associated blood losses may stem from GI bleeding, internal or external hemorrhage, or excessive reduction of intravascular plasma volume and body fluids. Disorders that may cause hypovolemic shock are dehydration from excessive perspiration, severe diarrhea, protracted vomiting, intestinal obstruction, peritonitis, acute pancreatitis, and severe burns, which deplete body fluids. Associated effects may include metabolic acidosis with the accumulation of lactic acid, irreversible cerebral and renal damage, and disseminated intravascular coagulation. Treatment of hypovolemic shock focuses on prompt replacement of blood and fluid volumes, identification of bleeding sites, and control of bleeding. Without fast, aggressive treatment, further collapse that can cause death ensues. Compare cardiogenic shock. See also electric shock, shock. Critical care A rapid fall in BP due to a ±20% ↓ of blood volume Etiology GI tract and other internal or external hemorrhage, loss of blood volume and body fluids–eg, diarrhea, vomiting, intestinal blockage, inflammation, burns, etc. See Shock, Volume depletion. Shock caused by a lack of circulating blood. A brain CT scan was performed 24 h later, revealing extensive cerebral ischaemia probably as a result of the severe hypovolemic shock experienced by the patient. The common maternal complications were hypovolemic shock, PPH and postpartum anemia. 6,16) As the disease progresses, patients develop nausea, vomiting, difficult breathing, abdominal pain, diarrhea, pharyngitis, conjunctivitis, organ dysfunction, hypovolemic shock, and bleeding from body orifices and intravenous injection sites, eventually ending up in death. According to its aetiology, hypovolemic shock can be divided into two categories--one caused by haemorrhage, the other by fluid loss. However, in present investigation, way out to decrease quantity of intravenous fluid administration was possible by providing hypertonic saline solution (HSS; 3%, NaCl) and Dextrose normal saline (DNS, 25%) followed by oral administration of jaggery and plenty of fresh water to increase energy level, restore intravascular volume to maintain an adequate blood pressure and cardiac output so that possibility of hypovolemic shock and dehydration may be decreased in buffalo. I don't think the cause of death was hypovolemic shock, as a person dying from loss of blood would not "utter a loud cry and give up his spirit. Re: Terry McDermott, "The physical effects of the scourging and crucifixion of Jesus"
Septic shock Hypovolemic shock Unknown cause shock Cardiogenic shock Obstructive shock Other: -- 3. A high-fidelity simulator, the Human Patient Simulator (Medical Education Technologies, Inc), was used as a teaching strategy and was programmed with 3 patient scenarios: hypovolemic shock, tension pneumothorax, and cardiac tamponade. Unusual complication of superior mesenteric artery syndrome: spontaneous upper gastrointestinal bleeding with hypovolemic shock. 3%, and the study showed that patients who suffered hypovolemic shock and received anticoagulants were more likely to develop re-bleeding after endoscopic treatment ( P = 0. The acutely intoxicated patient will be in acute distress, often dehydrated and in hypovolemic shock. He was given treatment in ICU of emergency deptt for Upper Gastroenteritis Track (GIT) Bleeding, Gastroenteritis and Hypovolemic Shock and was late shifted to East Medical Ward where the patient was diagnosed as an old patient of pre-existing liver disease.